One of the many reasons that distinguish Titanic from other shipwrecks is the poetic and dramatic note attached to it. The fact that the band kept playing even though people were historically running around in attempt to find a salvation and escape the immersing ship, gave an arguably romantic and sentimental note. More sentimental is the rumour that when the bandmaster Wallace Hartley’s body was pulled from the water days after the sinking – he still had his violin case strapped to his back. 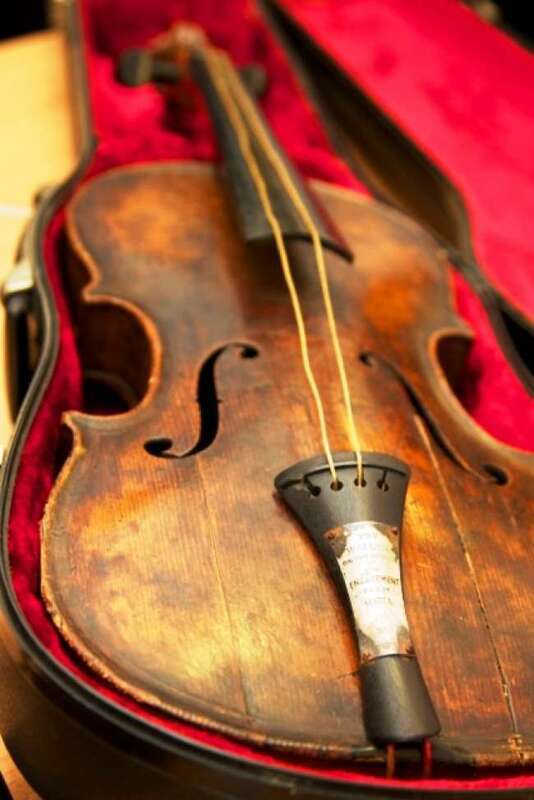 In March 2013, after two years of in-depth trace analysis by The Forensic Science Service on behalf of auctioneers Henry Aldridge & Son, and seven years of evidence-gathering by the Wiltshire-based auction house, it was announced that a violin found in a British man’s attic inside a leather case with the initials “W. H. H.” was the instrument used by Hartley, who, according to lore played, “Nearer, My God, to Thee” during the ship’s last moments.The identification was helped by an engraving on the German-made violin which his fiancée (Maria Robinson) had placed on the instrument in 1910 which read: ‘For Wallace on the occasion of our engagement from Maria.’Further tests by a silver expert from the Gemological Association of Great Britain confirmed that the plate on the base of the violin was original and that the metal engraving done on behalf of Maria Robinson was contemporary with those made in 1910. A CT scan enabled experts to view 3D images of the inside of the violin. After Maria Robinson’s death in 1939, her sister gave the violin to the Bridlington Salvation Army and told its leader, a Major Renwick, about the instrument’s association with theTitanic.The violin was later passed on to a violin teacher who gave it to the current owner’s mother. “It’s been in the same family for over 70 years,” Henry Aldridge & Sons state.Craig Sopin, the owner of one of the world’s largest collections of Titanic memorabilia, a leading Titanicexpert, and a general skeptic of Titanic claims believes the violin is “Hartley’s violin and not a fraud” reports ABC News. 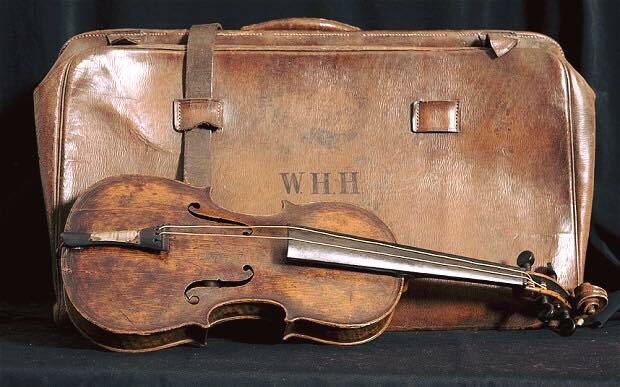 The Hartley violin was exhibited in Northern Ireland at the shipyard where the RMS Titanic was built, Titanic Belfast, and in the United States at Titanic Branson and Titanic Pigeon Forge museums. It was sold by auction house Henry Aldridge & Son in Devizes, Wiltshire, England, on 19 October 2013 for £900,000 ($1,454,400 US), as reported byBBC, NBC, and The Washington Post. The instrument will be available to the public for the first time after selling to an unknown prospect for $1.6m in 2013 – at Titanic museums in Branson, Missouri from 7 March to 29 May 2016, and Pigeon Forge in Tennessee from 5 June to 14 August 2016. This entry was posted in Boats, Home, Uncategorized. Bookmark the permalink.